Recent announcements by Exxon-Mobil and George Bush indicate that we are now moving out of the climate change denial phase and into the sabotage-and-delay-by-spurious-solution phase (with a good dash of solutions-that-are-worse-than-the-problem like nuclear power and sunlight blocking). It all means that serious catastrophe looks increasingly likely. We don’t really believe it will end in apocalypse but it’s worth thinking about complete apocalypse if only to get the full range of possible consequences clear in your head. After all, right now much of the developed world, particularly the US, is behaving as if the slightest change (eg less cars, more public transport) will be equivalent to apocalypse. 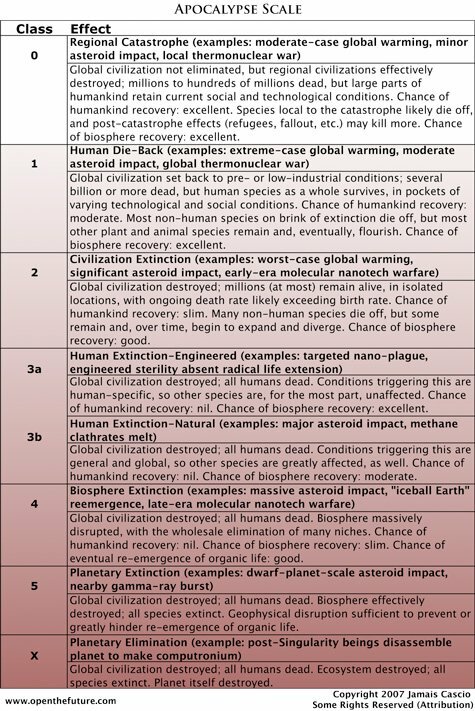 The reality is that even genuine and enormous catastrophe is not the end, humans are amazingly adaptive and some places have already had to face the problems that still lie ahead for the rest of us. Cuba has already had its peak oil crisis with the collapse of the Soviet Union in the early nineties. Ironically, almost 40 years of US economic embargoes may have made it the society most likely to survive intact, with lots of empty highways ideal for cycling. Depaving is a vast opportunity to free up land. There is more paved land in the U.S than officially designated wilderness. There is unused pavement even with the vast numbers of unnecessary motor vehicles today. Driveways and parking lots are easiest to remove. Tearing up roads is harder because of the deeper and harder road bed. However, trees can still be planted in roads and former roads. On the other hand Dmitry Orlov is grimly hilarious on the lessons the US might learn from the Soviet experience of national collapse and the adaptation necessary to survive. In all, I expect drugs and alcohol to become one of the largest short-term post-collapse entrepreneurial opportunities in the United States, along with asset stripping, and security. He isn’t alone in seeing what he wants to see of course – the Viridian camp sees a shiny green future awaiting us in the post oil world, old school oil guys like T Boone Pickens see a exploration and drilling bonanza, energy industry investors like Matt Simmons and Henry Groppe see soaring energy prices, gold bugs see rampart inflation and soaring gold prices, ferals and hippies see a return to living closer to nature, socialists see the revival of marxism, conspiracy theorists see government/elite conspiracies and the rise of the new world order, primitivists see the collapse of industrial civilisation and human dieoff, libertarians see an opportunity for the market to bring new energy sources and technologies to us, fascists see an opportunity for a return to authoritarianism and some of the uglier approaches to population control used by their ilk in the past, economists see supply and demand issues being resolved by energy prices, military-industrial complex members see the need to militarily dominate the energy rich regions of the planet, end-times Christian fundamentalists see another symptom of the impending rapture and survivalists see an opportunity to say “I told you so” and finally get to use the skills and tools they’ve spent their lives practicing for. or if they are serious (from the National Atomic Museum, Albuquerque, New Mexico, photos by Life on the Edge). Have a happy apocalypse! This entry was written by Ian Milliss, posted on 27 Jan ’07 at 11:17 pm, filed under activism, people, planning, transport. Bookmark the permalink. Follow any comments here with the RSS feed for this post. Post a comment or leave a trackback: Trackback URL. Good Post. I enjoyed your commentary. On related matters, USA Today has recently reported in its Washington Section that the CIA plans to utilize more open sources and blogs in its intelligence work and outsource more of its intelligence software development to commercial contractors in an attempt to re-establish itself as the premiere world intelligence agency. The “Strategic Intent” is posted on the CIA public web site. Defense Industry Daily further reports that General Electric is gobbling up Smith’s Industries for $4.8B. 2. Northrop Grumman Corporation and Hewlett Packard are two huge government contractors in the Pentagon and CIA custom software development arena. Their combined contracts with the government just for IT are in the multiples of millions. I wonder what the advisory board is filling the CIA’s ear with? 3. Washington “Think Tanks” are fronts for big time lobbies, sophisticated in their operations, claiming non-partisanship, but tremendously influential on K Street. If a lobby cannot buy its way in, why not sit on the advisory board? 4. GE already has the military aircraft jet engine market. In buying Smith’s, it takes one more major defense corporation out of the opposition and further reduces the government’s leverage through competition. GE now joins the other monoliths such as Lockheed Martin, Boeing, General Dynamics, Northrop Grumman and Raytheon with tremendous leverage in the $500B +++ per year defense market. 5. Note the synergy that now exists between the Pentagon and the CIA. Note the influence by the major corporations. 6. Also note the balance in your bank account and your aspirations for the generations of the future. Both are going down. It’s time to ban the older style light bulbs. It’s already on the agenda in California. More realistically, it’s time to ban coal (they’re working on that in California too). If you want to see how stupid Sydney has become, check out the comments today on this SMH blog about the cost of green energy. Oh well, let them drink their own piss.